AS Tallink Grupp and Rauma Marine Constructions (RMC) recently signed the contract for the construction of a new LNG-powered fast ferry for the Tallinn–Helsinki route shuttle operations, which enters into force today. Similar to the group’s newest vessel Megastar, the new shuttle ferry will also be dual fuel operated. The new vessel’s overall length will be approximately 212 metres and it will be able to carry 2,800 passengers. It will cost approximately EUR 250 million and it will be built at the Rauma shipyard in Finland, providing approximately 1,500 man-years of employment for the shipyard. The delivery of the vessel is expected in January 2022. With a gross tonnage of approximately 50,000 and a service speed of 27 knots, the ferry will use Liquefied Natural Gas (LNG) as fuel and meet all the current and known future emission regulations. In comparison with the group’s latest vessel, the new ferry will have 30% larger LNG fuel tanks, reducing the frequency of bunkering of the vessel. Further, with enhanced new design, the CO2 emissions of new shuttle ferry can be reduced by 10%. Commenting on the contract, Paavo Nõgene, the CEO of Tallink Grupp, said: “The construction of Megastar and bringing this next generation vessel onto the Baltic Sea has transformed our shuttle service between Tallinn and Helsinki. The vessel has been extremely well received by our customers, with over 4 million passengers already having travelled on the vessel. In addition to the increased passenger comfort, just as importantly, Megastar has taken our operations also to the next level in terms of environmentally friendly operations and increased efficiency. 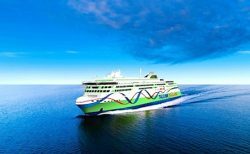 AS Tallink Grupp is one of the leading providers of passenger transport and cargo transport services in the northern part of the Baltic Sea region. Rauma Marine Constructions (RMC) is a wholly Finnish-owned shipbuilding company specializing in building and servicing multipurpose icebreakers, car and passenger ferries and naval vessels.